West Virginia State Capitol measures 292 feet from base to tip, but it has only four floors located in Charleston. The neo-classical monument hall reaches its height by way of its gold-leafed dome, which stands five feet taller than the dome on the United States Capitol Building. Designed by Cass Gilbert and constructed in 1932, the building has limestone pillars at its North and South entrances. The grounds of the historical monument are decorated with fountains as well as statues in the likenesses of Abraham Lincoln and Stonewall Jackson. Kanawha Valley Building measures 265 feet tall and has 22 stories. This presents a challenge in determining which building I should visit in my quest to climb the tallest building in each state. 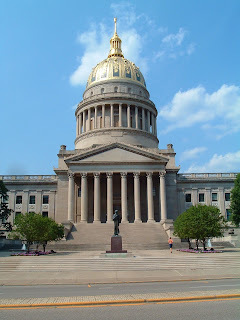 I will most likely run up both of these West Virginia buildings to be certain I have accomplished my goal, but I have chosen to count West Virginia State Capitol as the taller of the two. Click here for the list of the tallest buildings in each state. I believe the tallest building in West Virginia is actually the B. O. P. in Weirton, but I can't find documentation on line to prove it. Thanks for your comment! From what I know The B.O.P (Basic Oxygen Plant) closed in 2005 and was scheduled to be demolished in 2012. I can't find how tall the plant is but if it is/was not operational that would explain why it is not recognized as the tallest building in the state.